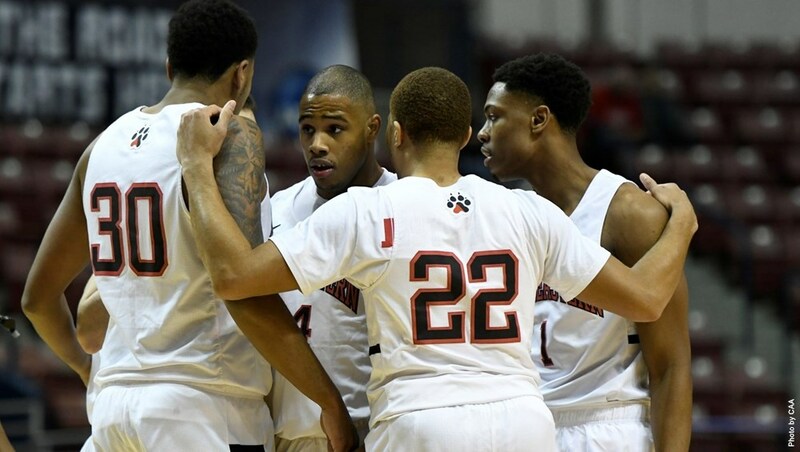 On Wednesday, the Colonial Athletic Association preseason poll was released, with Northeastern chosen as the favorite to win the CAA Championship, followed by Charleston, Hofstra and William & Mary. Northeastern received 35 first-place votes; Charleston, the only other team to receive first-place votes, got just five. Northeastern senior point guard Vasa Pusica garnered First-Team Preseason All-Conference honors, and junior swingman Shawn Occeus received an honorable mention. Hofstra senior guard Justin Wright-Foreman was the CAA’s Preseason Player of the Year. A little over seven months ago, on a windy night in Charleston, South Carolina, Anthony Green, Northeastern’s powerful center, corralled a shovel pass from Max Boursiquot and threw down one of his typical basket-quaking dunks. The Huskies led 44-27 with 16:35 left to play. The College of Charleston Cougars, led by senior guard Joe Chealey, stormed back to tie the game with 10 seconds remaining. They never trailed in overtime, claiming the CAA Championship Game–and a trip to March Madness–with an 83-76 win. But final game aside, Northeastern had an incredible 2017-18 season. Though the preseason poll of coaches, media relations directors and media members had them finishing sixth, they tied for the conference’s best record (14-4) and came within a bucket of the conference crown. With only Devon Begley graduating, the Huskies have essentially returned all their key players, including starters Pusica, Green, Shawn Occeus, Donnell Gresham Jr., and Maxime Boursiquot, as well as key bench players Bolden Brace and Tomas Murphy. 90 percent of the Huskies’ points, rebounds and assists came from returning players. Hofstra will challenge Northeastern with four returning starters, headlined by Wright-Foreman, the 2017-18 CAA Player of the Year and fifth-leading scorer in the nation. William & Mary returns three double-digit scorers from the first NCAA team to log a 50/40/80 slash line for the year. Junior forwards Justin Pierce and Nathan Knight, both Preseason All-Conference Second Teamers, will lead the Tribe. But it is Charleston, the only non-Northeastern team to receive first-place votes, that will most threaten the Huskies. The Cougars are returning a number of key players, most notably Preseason All-Conference First Teamers Jarrell Brantley and Grant Riller. But Joe Chealey, who keyed the Cougars attack in the CAA Championship and throughout his senior year, signed a two-way contract with the NBA’s Charlotte Hornets on Oct. 13 and, as such, will be of little use to Charleston this season. The Huskies begin their season against Boston University on Nov. 6; their conference slate kicks off Dec. 28 against Drexel. Armed with the CAA’s reigning Coach of the Year (Bill Coen), Player of the Year runner-up (Pusica) and Defensive Player of the Year (Occeus), the Huskies are eyeing revenge for last year. If the coaches and media professionals are to be believed, they’re favored to get it.